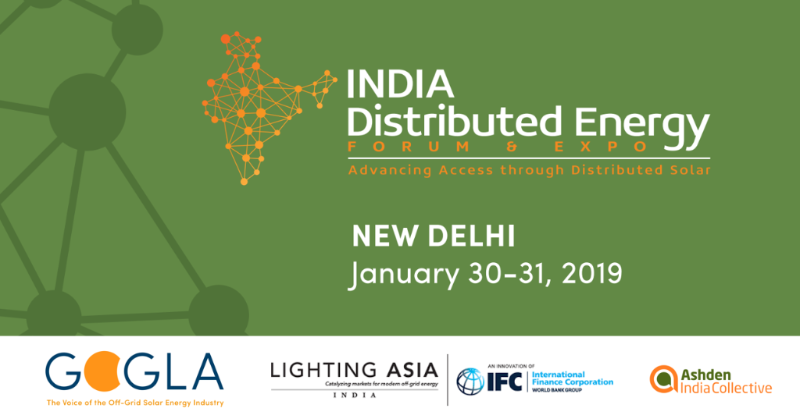 Join Lighting Asia/India in New Delhi for the India Distributed Energy Forum & Expo. Jointly organized with GOGLA and Ashden India Collective, the conference will take place in New Delhi from 30-31 January 2019. These two days provide a platform for the India Distributed Energy community’s efforts to chart the business-driven route to improved energy access to reach the 33 million Indian households yet to be electrified. Keeping the private sector at the center of these discussions, the event aims to fuel dialogues around the future potential for the distributed solar market and efficient appliances in India. With its huge local market along with strong manufacturing capabilities, India has the potential to become a global leader for distributed solar energy solutions. IDEF 2019 will provide a platform for innovative global and local companies to exhibit their product range to more than 250 stakeholders including government representatives, potential business partners, financial institutions, development partners, and industry practitioners. How will quality off-grid solar products and appliances boost market growth? What’s the future of investments in distributed solar in India? What can the Indian sector learn from the African market on last-mile innovation? Take a look at the full agenda to learn more about each session of the two-day conference. Don’t miss your chance to engage with 250+ industry leaders, policy-makers and potential business partners and investors.